This post contains TracfoneReviewer's full review of the Samsung Galaxy S6 which is available to use with Tracfone. 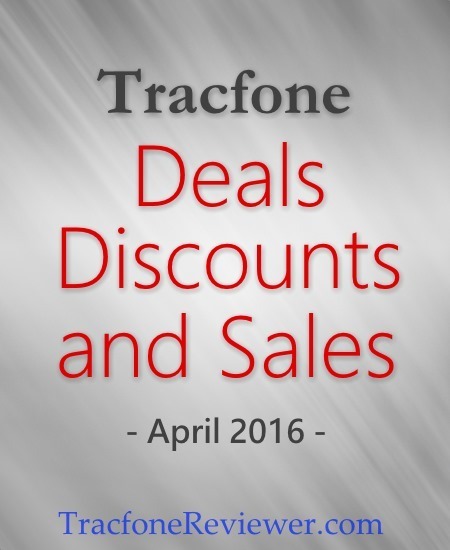 We cover lots of Tracfone related topics including news, reviews, deals and promo codes. So take a look around the blog and we hope you find the information useful! If you're a Tracfone customer and looking for a phone that can handle lots of apps at once, can take great pictures, has a beautiful touchscreen and runs fast and smooth, you might be really interested in the new Samsung Galaxy S6 Tracfone recently released to use with their prepaid service. 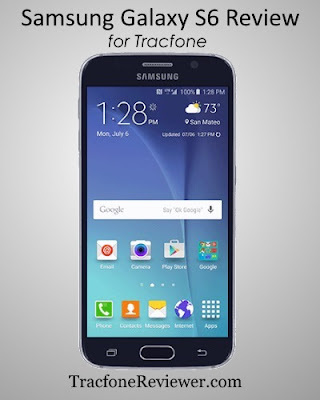 The S6 is a newer phone, only just released to the public in 2015, and now it is also available from Tracfone. When it was released it was one of the best phones money could buy, and it still has the power to outperform the majority of smartphone devices. The Galaxy S6 comes with a stunning 5.1" touchscreen, a 16 MP camera, and Android 5.0 among other features. As you can see, one of the main drawbacks about the S6 is the price. You could buy an unlocked S6 and bring it to Tracfone's BYOP program to save some money, but the phone is still retailing for $400-500. For more on bringing your phone to Tracfone, visit our Tracfone BYOP page. Let's get into the full list of features and phone specs for the Galaxy S6 to get a better idea of what it has to offer. Size: 5.65" x 2.78" x 0.27"
A couple of the phone's specifications are really impressive, namely the fact that it has two quad-core processors and 3 GB RAM. That's a lot of power packed into this device. Obviously it will be able to keep up with almost any app, and will be able to run multiple apps at once without any issues. But there are a couple of things about this phone that may make it not such a great choice for some people, and we are going to go over that next. We like to start off with the positives about this phone, of which there are a lot, and then we go over a few things that we don't like. First off, the S6 comes packed with high-performing hardware - which is what you would expect from the flagship device. It has 3 GB RAM (more than any other Tracfone device at this time) which allows for more multitasking and more apps running at once without any issues. Phones with 1 GB of RAM or less tend to have trouble running several different resource-intense apps at once, but the S6 should have no issue. Combine that with the two processors, each quad-core for a total of eight cores (octa-core), and you've got a very powerful device. If you're looking for storage, the S6 also has you covered, coming with 32 GB of internal memory to hold apps, photos, videos, downloads and everything else. The cameras on the Galaxy S6 are also impressive. The rear facing camera is 16 MP and has optical image stabilization (helps keep your images sharper) and LED flash. The front camera is 5 MP and both cameras have autofocus, touch to focus, auto-HDR, face detection and more. The built in camera app comes with a lot of extra features, including manual exposure controls which some photographers might enjoy using. The rear camera on the S6 is quite good, and will allow you to capture vivid and detailed images of the world around you. Both the front and rear camera can record HD video, with the rear camera also capturing slow motion shots at 120 fps. You can view a gallery of beautiful images taken with the Galaxy S6 to get a better idea of what you can do with this phone. Lastly, we want to share some additional details about the 5.1" touchscreen on the S6 because it is worth talking about. The size is certainly not the largest (the ZTE Quartz has a 5.5" screen), but it is the prettiest. The resolution is an amazing 1440 x 2560, which gives you a pixel density of over 575 ppi. To put that in real words, you get a screen that looks really good and is very clear. For some perspective, most Tracfone devices have a screen resolution of approximately 400x800, which leads to a pixel density of about 200 ppi. This isn't bad, but the screen on the S6 will blow it away. There's more good things we could say about the S6, but we want to get to a few issues that may turn a few potential buyers away from it. There are a few things about the Galaxy S6 that should be considered if you're planning to get this phone, For some, these issues may be enough reason not to get this phone, for others, it won't really matter. The first thing we don't like is the price, but it's hard to really complain about it too much since this is a high-end device. But Tracfone users tend to be very money-conscious, and few will be as interested in this phone once they learn about the $599 price tag. Another issue some consumers may not like is that the battery on the S6 is not removable. So if something happens, or you just want to take the battery out, you can't. Additionally, there's no external card slot for a micro SD card. The amount of onboard memory is very good, but if you want to load up a bunch of music you have on an SD card, you won't be able to. As we said, these are small issues with the phone that we thought should be mentioned for those considering purchasing this device. The Samsung Galaxy S6 is a phone packed with modern features and it is hard to compare it to any other Tracfone device except one, the Samsung Galaxy S5. So that's exactly what we are going to do in case some of our readers are considering which of these two devices to purchase. (The Samsung Galaxy E5 is also an option , but has a lot less to offer, and we compare it to the S5 in our review of the Galaxy E5). One might assume that the S6 would be the clear winner in a comparison of these two phones since it is the newer model, but it is not as simple as that. The Galaxy S5 (link to our full review) actually has a number of features that somehow were left off the Galaxy S6 and may make it a better choice for some. Hardware-wise, the S6 has the upper hand with 3 GB RAM (vs. 2 GB in the S5) two quad-core processors (vs one quad-core processor in the S5) and 32 GB memory (vs 16 in the S5). The Galaxy S6 also runs Android 5.0 while the S5 will only use Android 4.4. The touchscreen size is the same between these phones, but the S6 has better resolution (more pixels packed into the screen) and has Gorilla glass 4 (vs Gorilla glass 3 in the S5). Both the S6 and S5 have a 16 MP rear camera with similar features, but the S6 uses a 5 MP front camera while the S5's is only 2 MP. However, the S5 has several great features that were not passed on to the new generation. The Galaxy S5 is IP67 certified, which means it is dust and water resistant. You can put the S5 up to 1 meter below the surface of the water for up to 30 minutes and there should't be any issues (obviously we don't recommend testing this too much yourself, but there are plenty of videos on YouTube where other people thoroughly test this). The battery on the S5 is a little larger (2800 mAh vs 2550 mAh on the S6) and it is removable, which is important to some users. The Galaxy S5 also has a Micro SD card slot, up to 128 GB, which allows you to store a lot more information. Changes to the interface for the S6 leave users with less customization options (making the S6 a little more like an iPhone) which in some cases might be preferred. At the end of the day, these phones share a lot of features, but each have certain strengths. One final consideration is that the Galaxy S5 is currently $100 less expensive than the S6. Which phone is better? Hard to say, the S6 wins in performance and hardware, but the S5 has some important features that could be deal-breakers and we really like that it is dust and water resistant. 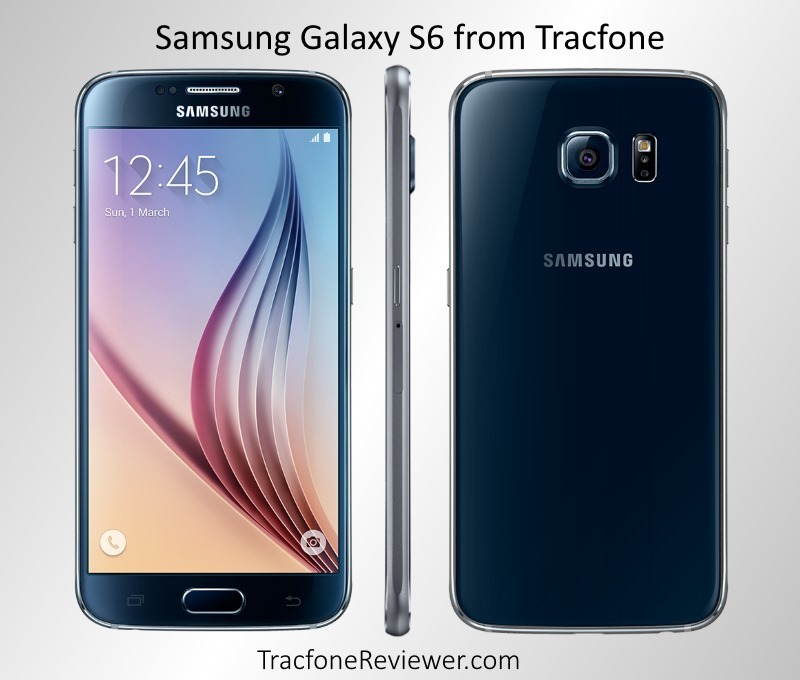 The Samsung Galaxy S6 is the best phone available from Tracfone (at this time) and is a high-end phone that you can use with inexpensive prepaid service. But the cost may be a be roadblock for many users who are interested in this phone. Keep in mind that Tracfone has a number of other devices coming soon, including several mid-level LG smartphones with Android 5.1.1. You can purchase the Samsung Galaxy S6 from HSN.com where it is offered with a bundle of minutes worth $100, plus extra accessories. We will update if the phone is released elsewhere. Remember to verify you have CDMA service in your area (check on the Tracfone website) before you buy. You can view the Tracfone Tutorial for the S6 to learn more about it, and learn how to use it. If you're new to Android phones on Tracfone, read our guide for How to Check your Airtime balance which shares several different methods for tracking your minutes. Also take a look at our Android Tracfone List, which is where we list each of the smartphones from Tracfone in one convenient list so you can compare features. Drop a comment below with your thoughts or questions, and be sure to follow us on Facebook where we have a growing community of Tracfone users. Below are some details from several new phones that will be coming to Tracfone in the near future. If you're unfamiliar with the TracfoneReviewer blog, take a look around, we share lots of information about Tracfone including reviews, news and promotional codes. 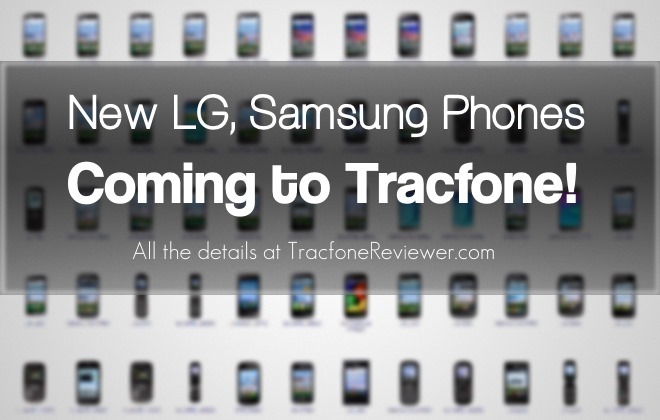 New Tracfone Smartphones are on the Way! There is a handful of new Android powered smartphones on the horizon for Tracfone and we are excited to be sharing the details on some of these phones below, including the Samsung Galaxy S6. While some of these devices will be mid-range phones similar to the LG sunset, many appear to use Android 5.0 or newer. There are also several, including the Galaxy S6, that will have more robust features and performance. Tracfone continues to expand its offering of smartphones as it slowly works to phase out older, non-smartphone devices. While they still sell and support non-Android phones, many customers have already switched to a smartphone. In a recent survey we conducted here on the blog, 65% of the 260 respondents already used a Tracfone Android device, while only 17% still used a non-Android phone. The remaining 18% use a smartphone on Tracfone BYOP. The time-frame for when these new devices will be released is unknown, and it could be days or months. We're not even sure where they will be offered, as several recent smartphones, like the Samsung Galaxy Core Prime, have only been available from 3rd party retailer HSN.com. We will update as soon as these details become clear. The question we are wondering is whether we will see a higher-end smartphone at a more reasonable price. The Samsung Galaxy S5 is a high-end phone, but it also comes at a high cost, which many users cannot afford. The Galaxy S6 is Samsung's flagship phone from 2015 and the new version of the Galaxy S5 which was released by Tracfone a few months ago. While the S6 does come with a number of nice upgrades and new features, it still shares a number of similarities with the older S5. This isn't necessarily a bad thing, as the S5 already had great features, but if you're expecting a significant change, look elsewhere. A 5.1" touchscreen and 16 MP Camera come with the S6 (same as the S5) but the screen has higher resolution. The Galaxy S6 also runs Android 5.0 and has 3 GB RAM, plus an improved appearance. When the Samsung Galaxy S5 was released for Tracfone, it started at $499, so we expect the S6 will (unfortunately) be at a similar price. The Galaxy S6 has been released and is available from HSN. You can also take a look at our full review of the Samsung Galaxy S6 for more details, including a comparison to the S5. Update - The Galaxy Grand Prime is available for $99 from Bestbuy! (currently on sale, retail price is $149). The Galaxy Grand Prime is like the older brother of the Galaxy Core Prime which Tracfone released along with the Galaxy S5 a few months ago. The Grand Prime is bigger, more powerful, and can handle more. It comes with Android 5.0, a 5.0" touchscreen and an 8 MP Camera - all improvements over the Core Prime. This phone (along with some of the others below) will make a great option for many Tracfone users to upgrade to from older smartphones. No word on the release date, but we think it will be released at the same time as the Galaxy S6 (whenever that might be). View this devices Tutorial from Tracfone for more details. 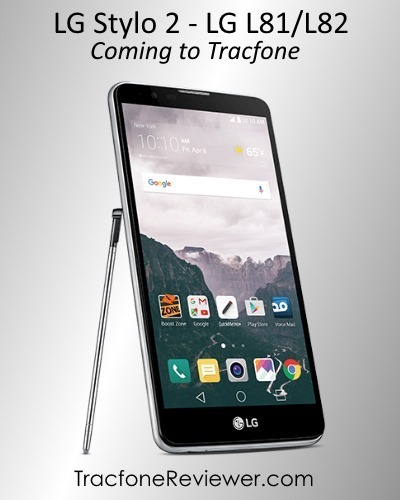 The L43 and 44 appear to be the Tracfone versions of the LG K4, which is a newer phone only just released in January 2016, and comes with a 4.5" screen, Android 5.1.1, 5 MP camera and quad-core processor among other features. This appears to be very similar to the LG Sunset, but maybe a little newer. It looks like Tracfone will be releasing a whole lineup of LG phones - the K4, K7 and K10 (below) which will provide some really great options for consumers. As with the K4 above, the LG K7 (L51/L52) was released in the beginning of 2016 and sports some nice features like a 5.0" screen and Android 5.1.1. Further details are a little murky, as there are at least two versions of this phone and we're not sure which version Tracfone will use. We will be sharing more on this phone as things clear up, for now you can view the Tracfone Tutorials for each device, although we're not sure if they are completely accurate at this time. Now these new LG phones really start to get interesting. The LG Premier (Tracfone version of the K10) comes with a 5.3" touchscreen, Android 5.1.1, and an 8 MP camera. It looks like the Premier will also have 16 GB internal memory, a quad-core processor and 1 GB RAM, although we're not sure if the Tracfone version will be exactly the same. As with the other phones listed, we will add more details as the information becomes available. For now, take a look at the device tutorials, although we're not confident in their accuracy. The last phone we're going to look at in this post is the LG L81 and L82, which appear to be the LG Stylo 2. This phone will have a 5.7" touchscreen display, Android 5.1.1 (or perhaps newer), 8 GB internal memory and 1 GB RAM. There is not a lot of additional information available on the Stylo 2, or what the Tracfone version will offer, but it looks like it will be a fairly powerful but still budget friendly device. We expect it to retail somewhere around $200. This phone offers a good blend of great features, while still keeping the cost somewhat reasonable and we are excited to see what it will have to offer. You can view the tutorials on the Tracfone website, but, as with some of the other phones above, we're not sure how accurate they are, and some of the information might just be placeholders. Update - The LG Stylo 2 is available on HSN.com with minutes bundle for $199. That concludes our look at some of the phones that Tracfone will be releasing in the near future. Please leave a comment with which phone is most interesting to you, and if you have any questions or thoughts. We will be also sharing more about several new ZTE phones in a future post. For the latest news and updates, follow us on Facebook with more than 1800 other followers. Check out our recent list of the Best Sales, Discounts and Deals for April 2016. TracfoneReviewer is a blog that shares information, reviews and news about Tracfone Wireless cell phone company. We have collected lots of information, so take a look around if you would like to learn more! We all love to find a good deal on things we want to buy, and Tracfone devices are no exception. But it can be challenging to keep up with where to find the best deals on Tracfone phones - both because they are offered through a lot of retailers, and because the price usually decreases the longer it is out. 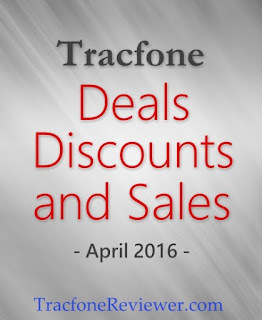 Here at TracfoneReviewer, we monitor and keep up with a lot of the phones and prices, and we want to share the best deals and discounts we have found with you. Prices do tend to go up and down, so we try to create a new list each month. Tracfone offers both smartphones, and non-smartphone devices to use with their prepaid service. There are several important differences, which you can read about in our post, 6 Major Differences between Tracfone Smartphones and Non-Smartphone Devices. We aren't including any phones in this list that would be used on Tracfone BYOP, but there are a lot of cheap smartphones available on Amazon, eBay and other sources that you can bring to Tracfone. Visit our Tracfone BYOP page to learn more, and view a list of compatible phones. Now let's get to the list of deals on Tracfone devices! The following deals are in no particular order, and highlight a variety of different devices that are priced below their typical cost. The LG 306G is the only non-smartphone in our list, but it still comes with a 3.2" touchscreen. This phone is one of the best options for those who don't want to change to an Android device. One of the main benefits of keeping a non-smartphone deice is that you can still use promo codes when adding new airtime cards. Take a look at our review of the LG 306G to learn more. The Ultimate 2 was released a little over a year ago now, but it still performs well as a smartphone with a 4.5" touchscreen, Android 4.4, and 5 GB internal memory for storing things. You can view our full review of the LG Ultimate 2 and learn more about all the features it offers. If you're looking for just the phone, at $60, it's a pretty good deal and about the lowest we've seen anywhere. But if you really want a great deal, get the phone bundle from HSN which includes a 1 Year/400 minute airtime card worth $100, plus other accessories, all for just $90. When the LG Sunset was released it was the first Tracfone smartphone that had 4G LTE service. That, along with 8 GB internal memory and Android 5.0 make it a great smartphone for many people, and it still comes in at a fairly reasonable price. Take a look at the LG Sunset Review to see full spec and features for this phone. As with the Ultimate 2 above, you can get the LG Sunset in a bundle from HSN that includes a 1 Year/400 Minute airtime card worth $100. You can also get the phone by itself on amazon. The LG Power is very similar to the LG Sunset, except it doesn't come with 4G connectivity and it uses CDMA service instead of GSM. But other than that, the Power does include a 4.5" touchscreen, 8 GB memory, and Android 5.0. You can view our review of the LG Power to learn more about this device and see lots of user comments. Find the Power on Amazon for $59.99 which is the lowest price we've seen for this phone, and $60 less than what Tracfone.com was selling it for. Bonus - Tracfone Airtime available through eBay and BestBuy. Tracfone airtime cards are widely available online and in stores. But in many places you will end up paying a few extra dollars in taxes, especially on the Tracfone website. But, for some, you may be able to buy through eBay or BestBuy and not have to pay any extra fees. The airtime itself is not discounted, but you buy it without any additional costs and it is then mailed to you within a couple of days. Take a look at airtime cards on eBay and airtime on BestBuy. Those are the deals we've found, please let us know in the comments of other deals and sales you find and we may add them to the list! We recently conducted a survey and many of our readers shared their insightful opinions. We will be sharing some of the results in the near future as we sift through the information and organize it, so look for that soon! We recently reviewed two new phones that are more advanced than any of Tracfone's other devices. See what you think and read our Review of the Samsung Galaxy S5 and somewhat cheaper, Galaxy E5. Don't miss out on the latest news and updates, join more than 1800 others who follow us on Facebook! Every month TracfoneReviewer collects the promotional codes from Tracfone and shares them here on the blog for our readers to use. We also do lots more than just codes, so be sure to take a look around at some of our other informative articles! It's April, which means spring is here (or for some, just around the corner), and it also means we've got updated promo codes to use with Tracfone! You can use these coupon codes when adding airtime cards to your Tracfone prepaid device. Each code is for a specific airtime card, but can also be used with cards of greater value. For example, you can use the codes for a 60 Minute Card with the 120, 200 or 450 Airtime Cards (the 1 Year/400 Minute card and codes are the exception). There are lots of ways to add airtime, and one of the easiest is to simply go onto the the Tracfone website and add your new airtime card there, where you can usually test more than one code. You can find prepaid airtime cards in many places, including on the Tracfone website, and in many retail stores. Remember that promo codes won't work if you have a smartphone, which includes devices on the Tracfone BYOP program. 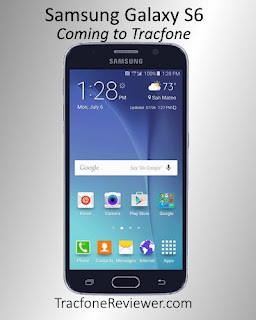 These phones already get triple talk, text and data, so Tracfone must not want to give out any more bonus minutes. We recently reviewed two new smartphones which may interest some, as these are the most powerful Android devices Tracfone has ever released. Take a look at our Review of the Samsung Galaxy S5, or the somewhat cheaper Samsung Galaxy E5. Both feature lots of internal memory, and great cameras. Below you can see the newest codes we've collected that are working for April, 2016. You can also visit our main Tracfone Promo Code page where we include many more codes to test and use. 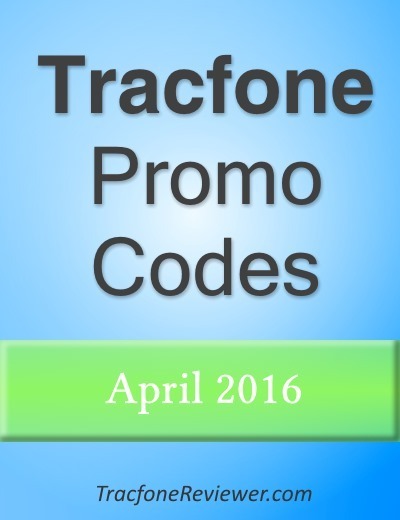 Those are the latest codes for Tracfone in April! We hope you find a code and get extra minutes for free! Leave a comment with which code you used and how it worked. If you're still new to Tracfone, or don't completely understand how it works, you might find our Beginners Guide to Tracfone a useful resource for learning more about how Tracfone works, and how to get the most from it. Stay up with the latest news, reviews and other info about Tracfone by following our Facebook page! We have over 1800 followers and post updates there from time to time. And if you're looking for reviews, look no further than our Cell Phone Reviews page which lists all our reviews of Tracfone devices in one place.